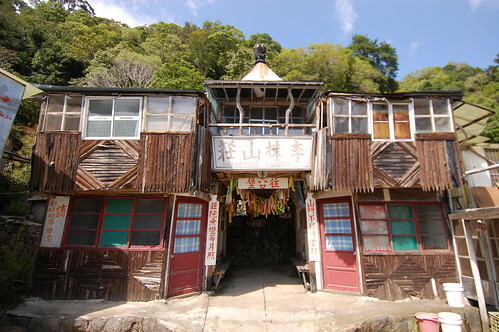 The Tapung Fort at the top of Lidong Mountain is a fascinating relic of Taiwan’s past. 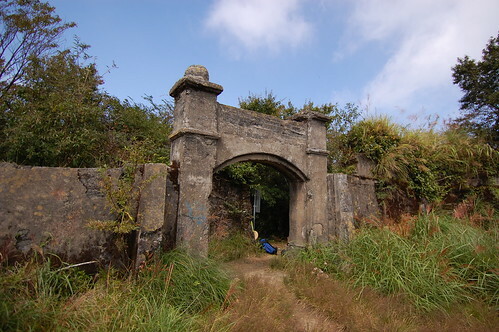 It was built by the then occupying Japanese army as a way to control the local Atayl tribes and, even though only the walls and main entrance survive, it still provides an intriguing glimpse into just how far the Japanese went to gain control over the island. In 1907, the Japanese government implemented their ‘Five-year Civilization Policy’ and began attempting to gain control over the more remote mountainous areas of Taiwan. 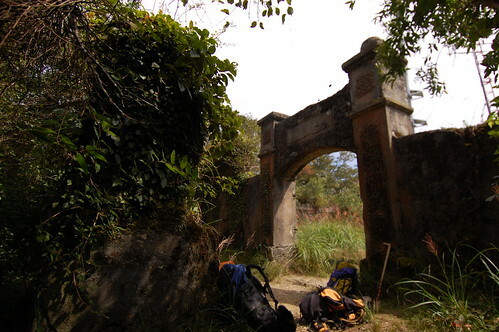 This eventually led to an expedition against the aboriginal tribes in the Lidong area in 1911. Over 2000 troops took part in the action and both sides suffered tremendous casualties but eventually the Japanese managed to gain control of the Lidong peak. The mountaintop proved to be of important strategic use to Japanese as they were then able to bombard the local tribes into submission. In 1912 defence works were built and later that year the Tapung Fort was constructed. The mountain top is some 1913m above sea level and must have required a tremendous effort to get all of the materials up there. The trail leading to the fort begins at the semi-abandoned Lidongshan Shanzhuang 李棟山山莊 (A shanzhuang is like a B & B in the mountains). There are still people who maintain the B&B and charge hikers $20 to pass through. I’m not sure if they have any right to do so but they do keep the place clean and they provide you with hot tea so it’s not all that bad! 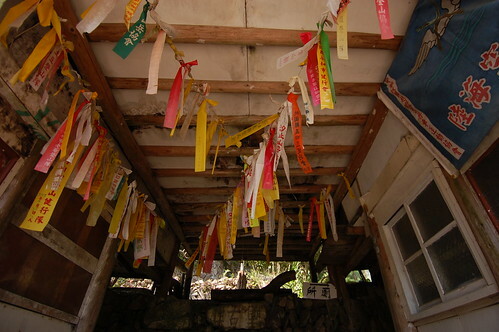 The entrance leading up to the hotel is covered in the plastic tags that hiking groups in the Taiwan leave to mark the route. 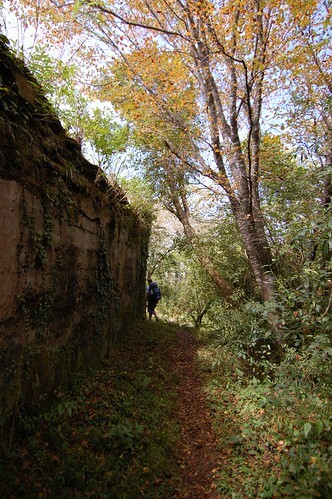 After paying our 20NT we went through the tunnel of tags and up onto the trail head at the back of the B&B. 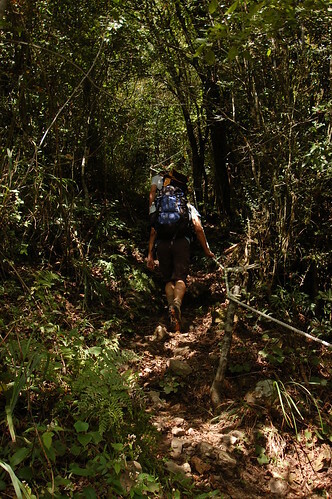 The path is fairly steep but not too difficult and the forest surrounding it is particularly beautiful. It actually reminded us all of the kind of woods you get back in England. 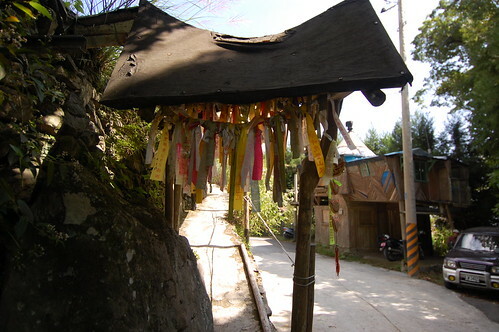 As we climbed up the hillside, the trail criss-crossed several times with a new dirt road and occasionally we could spot where the old Japanese road used to be. It was built on a very shallow plain to allow the transport of materials and must have switched back hundreds of times to get all the way to the top. 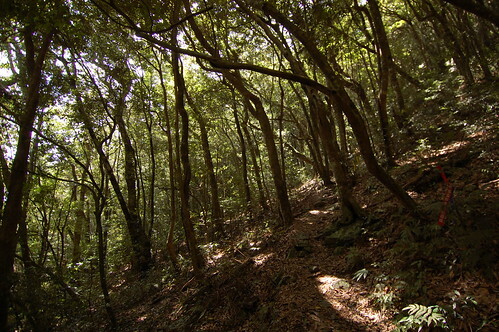 The previous day we had been on a huge hike up the nearby Wainaiozui mountain and every one of us could feel the tiredness in our legs. There are signs indicating the distance but they only served to show us how little distance we had covered and offered little encouragement! However, we persevered and after a tiring hour and half we made it the fort. It's a steep climb to the top! Now there’s a weather station where the fort’s buildings once stood and so after a quick explore of the remaining walls, we settled down for a bite to eat. The peak was surprisingly busy with a number of hiking groups all seeming to converge from different directions. They all arrived at the top in time for lunch and it was actually quite renao for while! The google map below shows the quickest way to get there directly from Taipei however we came via Neiwan and so I can’t vouch for the conditions of that road. Other than the tea, there’s no food or water so it’s best to prepare your own. The hike isn’t that long and took us about 3 hours but it’s well worth it to see a bit of Taiwan’s history. Hi, looks like an awesome site to visit! I am always looking for cool places to have a new adventure. We are pretty new to Taiwan but liking it so far. 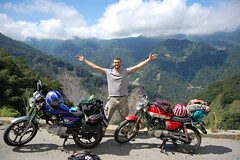 I’m glad you like it, it’s a really interesting place and the drive there is great, if you’ve got a scooter that is! Hi Stu, thanx for the info. 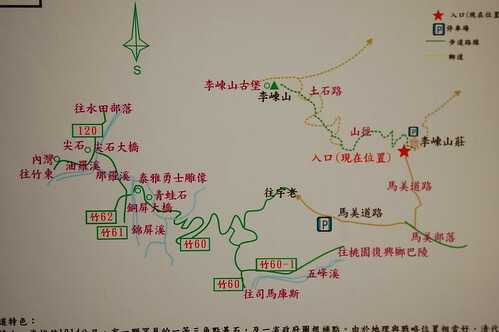 Your map shows you went past the starting point for a hike to a hot spring river. How was route 7 for a scooter? Will it be better by scooter than by car? Route 7 is great for scooters. It’s very steep and windy but a fantastic ride. You never get any of the bigger bikes on it because it’s too narrow and there’s generally very little traffic. A car would be fine too, but I’m not sure about parking near the trail as there’s limited space. If a few other ppl happen to be there, you might be push for space. If you’re talking about the springs by Baling bridge, they’ve been destroyed by a typhoon. As I found out to my great disappointment last weekend! No, I meant the SiLing spring. I just came back from there today, and it is AWESOME!!! Route 7 looks like it can be a hassle with traffic, but we were blessed with light traffic only. We went to the Siling springs a while back and they are fantastic. 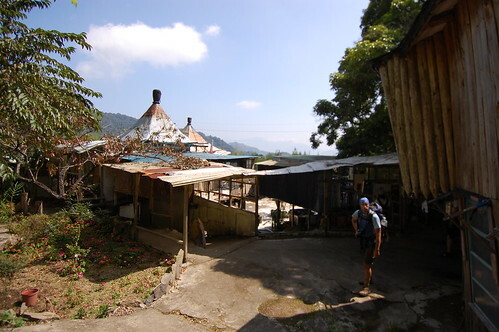 Another place that might interest you is the Ba Yan springs just north of Yangmingshan http://wp.me/pG0xF-4c. Nice find! Thanks for the blog. Thanks. I don’t think there’ll be a bus out there. It’s a long way from anything really. Hi this looks great, is it easy to get to from Neiwan? any ideas on how to reach this place with public transport? I don’t think it can be reached by public transport. Maybe get a taxi from Neiwan?